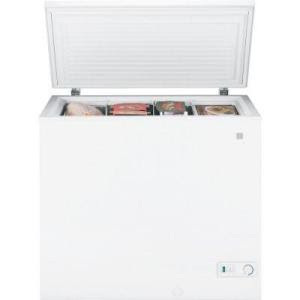 We have been thinking about purchasing a deep/chest freezer sometime in the near future. I would love to have extra freezer space to stock up on good deals when things are on sale. Also, I would like to freeze extra meals when I make them for the nights I don't have as much time to cook. I have been really good about making double meals for things that freeze well - for example, when I make lasagna I usually make three bread loaf size pans, instead of a 9 by 13 pan since it is just Adam and I eating it. Or when I make a ziti bake, I make two square 8 by 8 pans instead of one big one. These meals have been wonderful to have in the freezer for the nights I work because Adam can stick them in the oven and dinner is ready when I get home. Currently I don't have much freezer space to stock pile at all, or really just to keep the regular freezer items (like my ice cream maker insert, very important, right?). We have refrigerator with a freezer on the bottom and it is pretty small. So I need to feedback from all of you. Should I go with a 5 cubic foot freezer or the 7 cubic foot freezer? What do you love about having extra freezer space? What do you use it for the most? What are your favorite freezer friendly meals? Please share! I don't know what I would do without our freezer. Definitely great to stock up on sale items, store frozen berries after picking, sauces, extra soup, and other "double duty" meals like you said. We have a 7 cu. ft. I think and am happy with it. It also comes in handy if you win a 23 pound turkey that you don't plan on cooking right away!! I FINALLY after many years of wishing I had one, got a freezer. I'm so very, very happy with it. I decided, though, not to get a chest style and got the upright type and I'm so happy I did. I don't lose items buried in the bottom or have to practically fall into the bottom as one does (I find) with a chest variety. So I congratulate you on your decision to invest in a freezer and recommend an upright type rather than a chest. (just my own personal preference) Last summer I made oodles of pies when the blue berries, cherries, raspberries and apples were fresh. We are just now pulling out those delicious pies and they are as yummy now as they were last summer. I was terrified to spend the money on a deep freeze, but it has been the best investment ever. I love being able to cook ahead and buying in bulk. We went with the chest-style deep freeze, but I think if we had it to do over, we'd go with an upright. Things get buried in the chest-style, and I hate having to dig things out that have been in there for a few years. I think we went with the 7 cu. ft. freezer. We have a chest that is 5cub with a bottom drawer...not worth it. The drawer is constantly freezing shut. We had to defrost the whole thing to open it. 4 years of frozen food in there too! I love the extra freezer space in the garage. 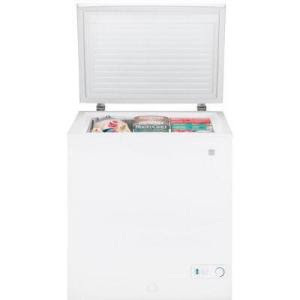 I have had a full size upright freezer for may years now and I love it! I buy meat in bulk, freeze fresh vegetables from my garden and fresh fruit. Also, I always have ice cream and popcicles for the kids! Great investment!